Tweets can have a lot of influence these days, especially when they come from someone like Elon Musk. Late last year, on Twitter, the Tesla CEO said, "Maybe interesting to work with Daimler/Mercedes on an electric Sprinter. That's a great van. We will inquire." Mercedes took notice of the tweet, and since then, Tesla and the German automaker have been talking about teaming up for an electric van project. According to Bloomberg, Mercedes Chief Executive Officer Dieter Zetsche is quoted as saying, "These talks are happening," adding that the "outcome is open." Tesla technicians currently use fossil-fuel powered Sprinters to travel to service locations. Musk became acquainted – and impressed – by the vans through these transactions. But the Tesla CEO isn't the only one fascinated by Daimler's high-topped, commercial vehicle. Last year, Amazon invested in 20,000 Sprinters and countless companies across the world use them daily. Over 3.4 million units have been sold in 130 different countries, according to Mercedes. Perhaps, the Sprinter's popularity is due, at least in part, to the fact it has little competition. Because the van is a Mercedes, it has amenities and advanced equipment other commercial vehicles do not. "Our new Sprinter is the first van of a new type – a fully connected integral system solution. We have made it even better with regard to its traditional strengths and have supplemented it with intelligent products and services," said Volker Mornhinweg, Head of Mercedes‑Benz Vans, in a press release early last year. Currently, the Sprinter van is available with either a diesel 3.0L V6 or a gas-powered 2.0L four-cylinder. Though later this year, Mercedes promises to roll out a new pure-electric eSprinter. The automaker says the forthcoming van will be powered by either a 55 kWh battery or a 41 kWh battery. The larger of the two storage devices will have a range of approximately 150 km (93 miles). Maximum payload will be over 1000 kg (2205 lbs.). 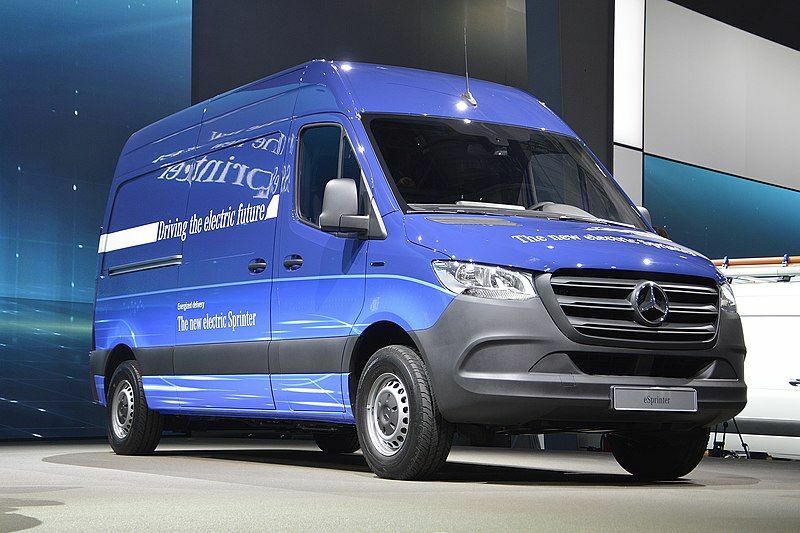 Should Mercedes and Tesla move forward with an electric van project, it won't be the first time the companies have collaborated. In 2009, Daimler had a 10% stake in Tesla, which it eventually sold in 2014. Prior to the sale, Musk's team supplied powertrain components for the electric smart car, Mercedes A-Class and Mercedes B-Class. What exactly a future collaboration between the two companies might hold is unclear. Many speculate Tesla may purchase eSprinter vans for use in its service fleet. No firm commitments have been made yet, however. Regardless, it's clear Mercedes is committed to growing its line of electric vans. Earlier this week, at the Annual Press Conference in Stuttgart, Bodo Uebber, Member of the Board of Management of Daimler AG, said, "The breadth of our electric portfolio of commercial vehicles is already unique in the industry. We are electrifying all of our model series of commercial vans. Following the eVito, the second model, the eSprinter now is about to be launched," Later adding that, "we want to shape the technological transformation from the top."